Instant Pot’s DUO60 multi-use pressure cooker is and may always be the best-selling cooker on Amazon (and it’s on sale at a deep discount for Black Friday right now!). But some people have big families and they need something with even more capacity. 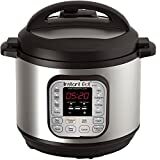 That’s where the Instant Pot DUO80 8 Qt 7-in-1 Multi-Use Programmable Pressure Cooker comes in, and it’s on sale right now on Amazon at a deep discount. This deal is good today only, not that it really matters — Black Friday deals on Instant Pots always sell out very quickly, so there’s no way this deal will last until the end of the day anyway.